Next year, the United Nations women, peace and security (WSP) agenda turns 20, and with that will come high-level commemorations to mark this important anniversary. However, 2020 can’t be viewed only through a celebratory lens, as fundamental challenges continue to plague the agenda. Women’s civil-society organisations working on peacebuilding, conflict prevention and gender equality remain drastically underfunded, even though investment in gender equality is a proven conflict-prevention strategy. Women human rights defenders are increasingly targeted, while the international community remains largely silent. Of most concern, women also continue to be locked out from formal peace processes. In 2015, ahead of the 15th anniversary, there were three high-level UN peace and security reviews, a global WPS civil society survey, a series of high-level events and numerous consultations around the world with women in civil society. For the NGO Working Group on Women, Peace and Security in New York, which I headed at the time, the year involved sustained advocacy alongside colleagues from around the world. A record number of member states and regional organisations spoke at that year’s open debate on WPS at the UN Security Council. While 2015 was a year of heightened activity and attention and brought some key gains and commitments, some of the progress was short lived and, in some quarters, the momentum that had been built dissipated soon after the anniversary year ended. It was a stark reminder for us to remain vigilant. In 2016, we started seeing an improvement in how the Security Council considered gender in crisis situations. 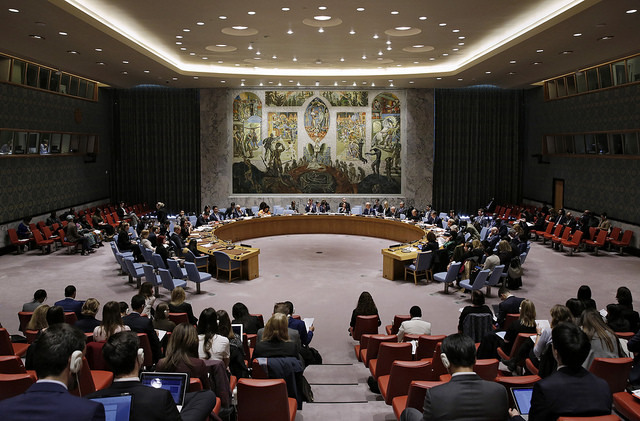 In 2015, less than 40% of crisis decisions by the Security Council made any reference to WPS. That was a clear sign that, despite it being an anniversary year for the agenda, the Security Council and UN leadership didn’t see WPS as relevant in times of crisis or in peace operations and processes. By the end of 2017, 98% of such decisions included WPS references. The recognition that all crises and conflicts have gendered elements is a positive development that can be attributed to the collective push in 2015 for context-specific implementation of the WPS agenda. Then came 2017 and the US-led cuts to peacekeeping budgets. The NGO Working Group on Women, Peace and Security was among the organisations to raise the alarm that gender posts were being disproportionally cut and downgraded. That came less than 18 months after the Security Council adopted resolution 2242, its eighth WPS resolution, which among other things called for the systematic deployment of senior gender advisers to provide strategic gender advice throughout all phases of missions and processes. In 2017, language in the mission mandate for Afghanistan relating to women’s rights and participation and girls’ education was removed under the guise of streamlining the mandate. Fortunately, those provisions were reinserted in the 2018 version of the mandate following significant advocacy from WPS civil-society organisations and key council members. The removal of gender roles and WPS references in mandates showed how fragile gains are and how easily gender provisions will be cut for cost saving or political expediency. A study commissioned by UN Women found that women’s participation increases the likelihood of a peace agreement lasting 15 years by 35%. That finding is systematically referenced by WPS-friendly governments as evidence of the agenda’s importance. Despite all the positive statements, women continue to be absent from peace negotiations. Peace agreements also remain devoid of gender provisions. We only have to look at the past four months to get a grim picture of how exclusive talks continue to be. Libyan women were largely missing from high-level peace talks held in Italy in late November 2018. Yemeni women were sidelined from the January 2019 talks in Stockholm, and Afghan women were excluded from the closed US–Taliban talks in Doha. Over the past few years, Afghan women have repeatedly warned of the dire consequences that closed-door talks with the Taliban could have for women’s rights. Last year, the UN secretary-general reported that 2017 was the first time in two years that most of the signed peace agreements that the UN had helped to broker lacked any gender references. Expressing his concern at this downward trend, he called for a redoubling of efforts to promote gender-inclusive processes and agreements. The question remains: how has this backsliding been permitted, given that so many national governments now align themselves with the WPS agenda, have implemented national action plans and support the proliferation of regional women mediators’ networks. It seems that WPS continues to be sidelined in favour of other political priorities. The WPS agenda was established as a result of a groundswell of advocacy from women activists around the world demanding equal access to peace and security decision-making. Nineteen years later, the fight to ensure women’s participation has yet to be won, but women peacebuilders haven’t given up. In 2020, the resilience and determination of conflict-affected women should be celebrated. Essential elements of the WPS agenda are being roadblocked due to a lack of political action. It’s time for states that call themselves friends of the agenda to draw a line in the sand and cease supporting talks that exclude women. Louise Allen is a global gender, peace and security consultant and an experienced women’s rights and WPS advocate. She is a former executive director of the New York–based NGO Working Group on Women, Peace and Security and has worked in Australia, in the Pacific, and at the UN in Geneva and in New York. Find her on Twitter: @AllenLouiseA. Image courtesy of UN Women on Flickr.